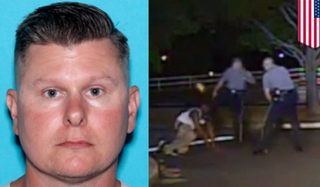 A Delaware police officer who was captured on police dash cam kicking a black man in the face as he bent to the ground has resigned. Police Cpl. Thomas Webster IV, who was acquitted in the 2013 assault, has made his resignation effective immediately. Officials describe Webster’s resignation as a “negotiated separation,” the Associated Press reports. Video of the 2013 incident shows Webster, who is white, ordering Lateef Dickerson, who is black, to the ground. As Dickerson appears to be lowering himself to the ground, Webster kicks Dickerson in the face, breaking his jaw. Webster told jurors that he had been aiming for Dickerson’s upper body and hadn’t intended to kick Dickerson in the face. AP reports that although a jury acquitted Webster of assault in December, he’d been on paid administrative leave since the incident. Officials did not comment on Webster’s resignation.